It was by chance we met Marom Hem and ended up on a memorable journey that helped shape our views of Cambodia. It was wet season. The rainfall the previous night had been heavy and the red dirt road was a muddy mess. We were in a tuk tuk on a trip through the Cambodian countryside to somewhere that felt incredibly remote. 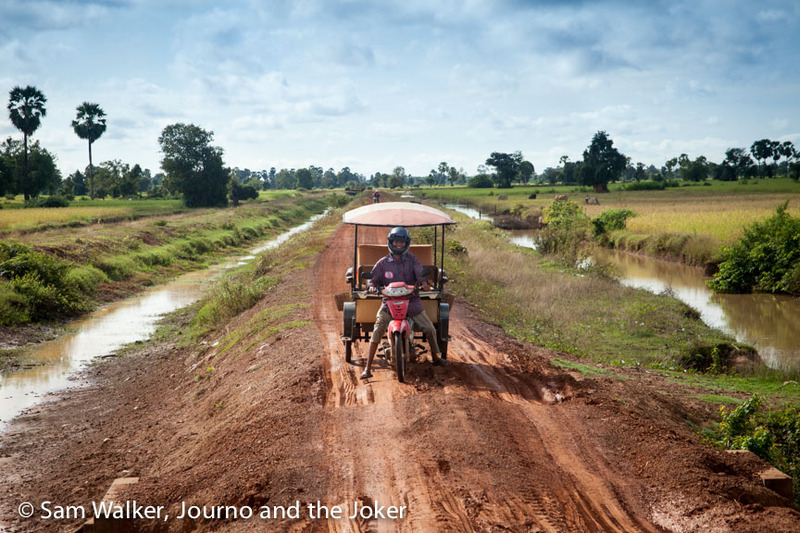 The slippery road stretched endlessly ahead, framed on both sides by vivid green rice fields accentuated with brown and red wooden Khmer houses. Old women tended to rice drying on the side of the road or walked a buffalo on to greener pastures. And as we slipped and weaved the wheels fighting for traction, we got bogged. Laughing, we got out and pushed, our thongs sticking in the slippery tracks and sticky red mud spattered over our feet and legs. And it wasn’t a one-off. The road was a challenge the whole way and seemed to take ages to get to our destination — Phnom Bok. These days, it is an easy drive on good roads and we’ve ridden the motorbike around it once or twice. It’s amazing what a difference a good road can make. While we climbed the 600 and something stairs of Phnom Bok — yep, thought it was going to kill us but it was worth the view — Marom washed his motorbike in preparation for the muddy trip home. For some it could have been a trip of hell. For us it was an enriching experience that shaped our memories and the warmth we felt for the country and the people. It was 2008 and it is a trip Marom doesn’t remember — who can blame him with the number of visitors he’s transported — but we remember it vividly. We’ve sought Marom out on subsequent trips, recommended his services to others and these days consider him a good friend. His suggested trip that day, was just what we were after. But there were so many factors on that first Cambodian holiday that could have prevented our paths from crossing. And it could have been a very different view of Cambodia if we’d continued with the rough and ready services of the guys who picked us up from the bus stop. We think we found the number one tuk tuk driver in Siem Reap. We are the same age, Marom and I — just a week between our birthdays. But our life experiences are a world apart. While I grew up in the “lucky country” living the carefree existence of most Australian children, the country of Marom’s childhood was far from lucky. While I played at kindergarten and began my first years of school, in a safe and happy home, Marom lived in a children’s centre, while the nation raged in civil war, education was scrapped and nearly a quarter of the population was killed. But in true Cambodian spirit, Marom says he was lucky, “very lucky” in fact. Under the Khmer Rouge, children were often taken from their parents and sent to live in a children’s centre. Husbands and wives were separated, families were torn apart. His parents lived apart, his younger brother stayed with his mum and they were able to have occasional family visits. But the children’s centre Marom was sent to was very close to his home and his grandmother was one of the carers. Sometimes he ran to his home to spend the night because it was close and he was so young — five or six years old — so they let him. He believes it was not such a big problem for young children his age as for older children. And for all these reasons he believes his family was lucky. But let’s not gloss over the situation. It was a dangerous time — frightening, confusing and food was scarce. “It was very, very dangerous,” Marom says. “Everybody said be careful of each other — you cannot talk about the true story. I can’t imagine what that must have been like for a child and the long-term ramifications it has potentially had on a nation where so many people lived fearing details of their former lives would be discovered, which could lead to torture and death. But that wasn’t the only challenge. While I was growing up with an abundance of fresh fruit and vegetables, meat, cereals and sweet treats, the Cambodian people were on the verge of starvation. “Everybody was very hungry,” Marom says. The diet consisted mostly of water and rice. Many foraged for whatever substitutes they could find but resources were stripped. After 1979, the Khmer Rouge fled and the Vietnamese came. It brought a different conflict and ongoing turmoil. He says things got better because there was no killing but people were still worried because there was still civil war and every night they could hear the boom of gunfire and explosions. But in 1981, with an education system still in disarray and so many people skeptical of the benefits of education, Marom’s parents and grandparents had different views. They insisted he go to school and learn. He was 10 years old and he started grade one. And he liked it. He finished high school — he had to move from his home town about 35 kilometres east of Siem Reap to finish his studies — and he attended private school to lean English. But only for about six months. “My mum sent me money for the school but not enough for private school. It is testament to his skill and determination that his English speech, vocabulary and reading and writing skills are so good, although he thinks differently. But his communication is excellent and part of what makes him such a good tuk tuk driver. Marom’s parents are rice farmers and money is and was tight. He wanted to continue to university after passing grade 12 but he didn’t have the money so decided to stop. At that stage, in the early 1990s there was not a university in Siem Reap and he would have had to move to Phnom Penh, more than 300 kilometres away. It’s a big move when you don’t have friends and family, money or a job. Instead of university he joined the police force and worked in a prison, documenting the prisoners. At night he was the guard. He met his wife at the prison and they married in 1995. They had two children — a daughter, who is 20 and a son, who is 17. But the marriage did not last. They parted ways many years ago but have not divorced. In 1997 Marom left the police force for greener pastures and took up a new career as a motodop driver. This is essentially a motorbike taxi and a very common form of public transport in Cambodia. But Marom was smart and realised he could get more business with a tuk tuk. Tourists usually travel in pairs or groups and so transport for a single passenger was limiting. So he bought his tuk tuk and became one of the first 20 tuk tuk drivers in Siem Reap. And he’s made his mark. Marom’s English is excellent — thanks in part to the Bangladeshi soldier posted here with the United Nations Transitional Authority in the early 90s, who would talk with Marom in English when he had free time. Marom has a great sense of humour and is forever making jokes — at himself, his friends and his guests. But he also knows what tourists want and nothing is too much trouble. He can organise tailor-made trips without batting an eye and always seems to know just the thing you are after. He is polite and helpful, will quickly resort to Google maps when you don’t know how to get somewhere and is always resourceful and well informed. I’m amazed at the information Marom has at his fingertips. We’ve spent many a good day out with Marom. There is never any pressure to go anywhere, buy anything or enter certain shops or restaurants. He is as honest as the day is long. 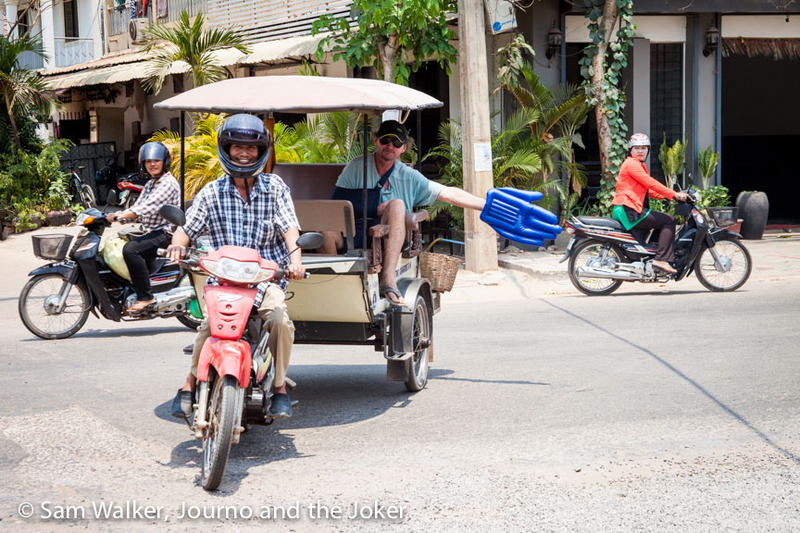 But tourism in Siem Reap is not what it was and one of his biggest challenges is competing in a market flooded with tuk tuks. When he started nearly 20 years ago there were only a handful of drivers and they were in great demand. Now every hotel, guest house and even massage spas have at least one tuk tuk. Of course, being top of your game means you do pretty well but the competitive industry is wearying. Marom has his own website and Facebook pages but says while he can speak English well he struggles with language that is interesting and will sell his services. It is a challenge in a flooded market. When Marom’s not driving the tuk tuk, you’ll often find him helping out at Two Dragons Guesthouse on 20 Street in Siem Reap. He might be waiting tables or pouring beer, he could be checking in guests, painting, or fixing the plumbing. Any odd job that’s going and he is there to help. He was even out helping when the roadworks were being done. Digging things up, tidying the verges, laying pavers and even hopping in the bucket of heavy machinery doing something with all those electricity wires. He’s a man with his finger on the pulse and the ability to solve problems and find solutions. He’s a man you can rely on, with a heart of gold and the willingness to help. We’ve asked him to help translate at the medical clinic, where he waited for hours with us the day my mum twisted her ankle and the night the Joker broke his collarbone. He also helped when the Joker needed a new passport and had to get a police report. Nothing is too much trouble. And there’s never a need to haggle. The price he gives is fair — actually sometimes he under charges and we have to set him straight. When you live in a foreign country it’s reassuring to have people like Marom around. People you know you can trust and who will give you sound advice. Marom is the oldest of seven children — he has three brothers and three sisters — and he is a big family man. 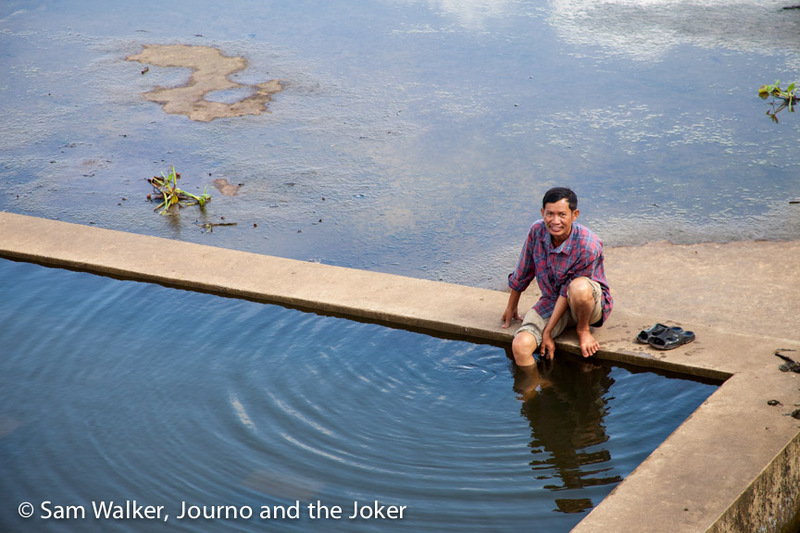 He goes back to his hometown, about 45km east of Siem Reap regularly to see his parents and his family. He likes to take care of his mum and worries when her health is not good. He loves children and spends a lot of time playing with nieces and nephews. He helps plant rice and harvest rice and tries to relieve the financial burden on his parents when he has the opportunity. And he is always up for a party. Put on some music and he’ll either be dancing or taking control of the microphone, whether it’s in the corner store with his tuk mates singing karaoke or at a wedding party. Marom is fun, interesting and intelligent. Still, I can’t help think how different our lives and how fortunate I was to get an education and go onto university. Who knows how Marom’s life would have turned out if he’d had the same opportunities. But what I really love is that he wants to do his bit and is already dreaming of a future where he is a farmer, planting sweet melons and teaching village children English in his spare time. Thanks for your friendship Marom. Our Cambodian experience wouldn’t have been the same without you in it. Thanks for stopping by and having a read. We love Marom too. A wonderful and intelligent person, who has done a lot to make our life in Cambodia easier. Wow – what a touching story. It is so easy, sitting here in Australia, to forget how very lucky we are.